Most of us are teachers in some or other aspects. A few of us are engaged in teaching profession, but others also impart teaching to either juniors, or to younger ones in the family. 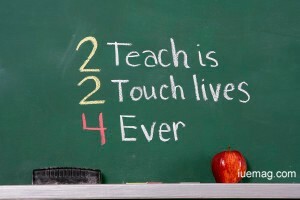 Teaching is a profession of commitments. If someone is committed to the cause of teaching, the exploration and dissemination of truth remains the only purpose for the teacher. There may be many hurdles. There may be some people who may stick to the prescribed syllabus. But there may also be some people who would go beyond the syllabus to do justice to the teaching profession. There is one similarity between great teachers and the worst ones. Both stretch beyond syllabus. The worst teacher never turns up in the class room, and therefore, doesn't cover the syllabus at all. The great teachers teach beyond syllabus because they want to prepare the students for the journey called life. It was 1997. I was talking to Rotary Club people who wanted to organise a seminar on innovative teaching. I came to know of Mr. Rawal. I requested him to meet me, and one day, a fragile, dilapidated and an old bony fellow came to me with a file of his innovations. Yes, it was Mr. Rawal. In spite of poor health he had tremendous energy and enthusiasm for the cause of teaching. He shared his stories of innovation. I found those innovations very impressive. I suggested him to write about them and share them in the conference. The conference was a successful event and the innovations by Mr. Rawal were appreciated by all the participants. On my advice he prepared a small note on his innovations and prepared a small documentary on those innovations and sent them to the NCERT and was overwhelmed when he was called to give a presentation. This made Mr. Rawal feel extremely happy, and he now realised that his struggle didn't go in vain. But it was too late by this time. I will share with you one of his initiative. It was January of 1993 when communal riots in Mumbai were making its headlines. What was not making its headlines was a small initiative by a teacher. Mr. Yogendra Kumar Rawal was a teacher in a private school where students from minority community were also in large numbers. Mr. Rawal used to discuss with the students about all important issues affecting the society. He was disappointed to listen to the conversation between a few students about religious issues. He realised that it is the lack of knowledge that is causing misunderstanding among the students. He decided to educate students about religions in a systematic manner. He taught about various religions in the class and clarified the doubts about the religious practices. He found that students were very inquisitive about those issues. He kept explaining every concept in detail. He took a group of Hindu students to a mosque and organised an interaction programme with a Moulvi. Similarly, he took a group of Muslim students to a temple and arranged their discussions with a Hindu saint. Then he took a mixed group to Gurudwara, a Church and a Jain Temple also. The efforts of Mr. Rawal remained unnoticed, but the students who studied from him, remember him for ever. He was able to create clarity about religious practices and remove all possibilities of rumours among the students. He didn't receive any support or cooperation from any person or institution in the process. Even the principal of his own school warned him and persuaded him not to proceed further. But for Mr. Rawal, teaching was a mission and imparting right education was the only purpose of living. He had an easier option of leaving the students with the darkness and allow the rumours and misunderstanding to continue to float. However, he chose the difficult option but this is what for he was built. His innovative and original approach to teaching was not digested by the school Principal who asked him to leave. Mr. Rawal joined other schools and received similar treatment. His initiatives were discarded, opposed and ridiculed. Among his many innovations he had also introduced a new method to train students on how to write in beautiful handwriting or calligraphy. This innovation was able to attract attention of a few school principals, who invited him to conduct a session for their teachers. Finally, one school appointed him to train teachers in teaching the students the art of calligraphy. Mr. Rawal used to share with the teachers his life-long journey of struggles. Two years later, Mr. Rawal sent me a message to meet him as he was unable to move out. I went to meet him and was delighted to see his joy and happiness. He was suffering from acute asthma and typhoid but all his pain had disappeared due to the letter that he had received from NCERT. NCERT gave him an appreciation letter for his innovations. NCERT further asked him to assist in preparation for a small documentary on his innovations so that those innovations could be popularised. A few days later, it was 5th of September and Teacher's Day. I was thinking about Mr. Rawal and wanted to meet him to celebrate the day. Suddenly I received a telephone from someone who just wanted to share with me that Mr. Rawal had taken his last breath on that day. Any facts, figures or references stated here are made by the author & don't reflect the endorsement of iU at all times unless otherwise drafted by official staff at iU. This article was first published here on 5th September 2014. The 20 hour obsession window! 7 ways to build a new habit with ease!